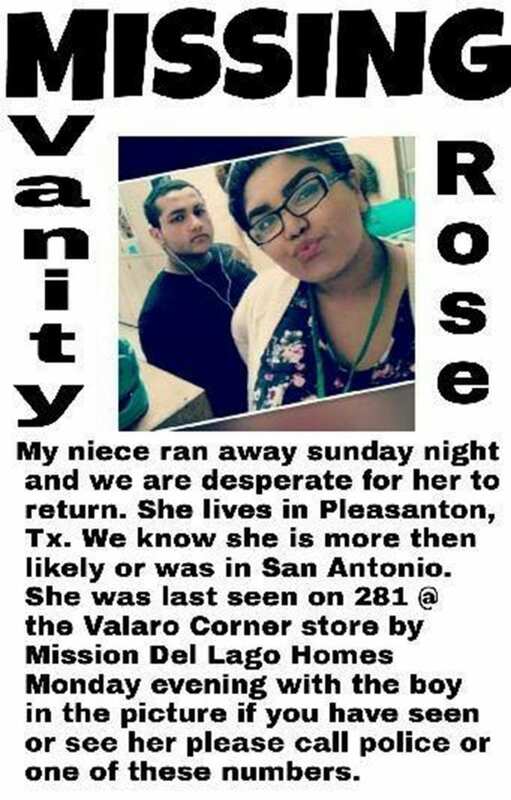 Vanity Rose has been missing since Sunday night, Dec. 3 and her family is desperate for her safe return. She lives in Pleasanton and may be staying in San Antonio. She was last seen on Monday evening at the Valero Corner Store on 281 South by Mission Del Lago Homes. Vanity was last seen in the company of the male in the picture. Please contact the Pleasanton Police Department at 830-569-3869 or the San Antonio Police Department at 210-207-7273 if you have any information.